Week 3: An Op-opportunity Awaits! Don’t op out of this fun geometric art exercise! Time to get funky with your black ink and a pop of your favorite color as we dive into to the Op Art movement. Taking inspiration from Bridget Riley and Frank Stella, repeat a simple shape or line to create a pattern that makes you look twice. Focus on black and white, but feel free to add 1 color accent. It may be useful to use templates, tape, rulers, etc. to keep things aligned. This week at Wet Paint, FW Acrylic Ink black or Dr. PH Martin’s Black Star in Matte Finish are on sale for 10% off MSRP! Use with a brush or a dip pen. Categories: Wet Paint Weekly Workouts | Tags: art supplies, Bridget Riley, Frank Stella, FW Acrylic Ink, pen and ink, Wet Paint St. Paul, Wet Paint Weekly Workouts | Permalink. Week 3: Joan Mitchell Mash Up! 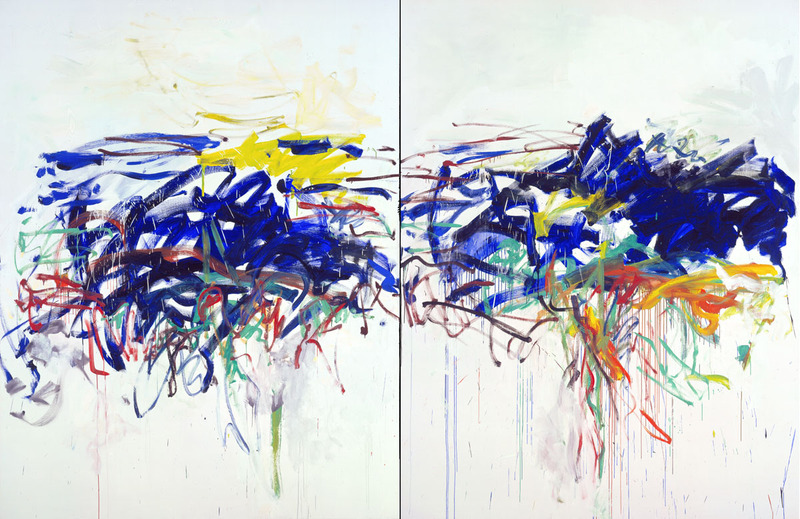 This week we want you to dip into abstraction taking inspiration from the abstract expressionist painter, Joan Mitchell. Looking at her body of work, there is a clear thought process and method to these paintings, so if you feel it is helpful, paint multiple spreads and pages and share your favorite (a double page spread would look fabulous with this workout). Some people find abstraction difficult. When approaching this workout, we suggest starting by making bold marks with your acrylic ink. Then smash your sketchbook closed to make the mirrored blot as your foundation shape. Add as many layers or colors of ink as you would like- dribble, drip, or flick your ink for added movement. When the fluid ink is dry, go in with a brush or paint marker to add more linework or color into your composition. It may be helpful to look at more of her amazing color work before you begin. This week at Wet Paint we have Daler Rowney’s FW Acrylic Ink at 25% off MSRP and Golden Acrylic’s new High Flow at 30% off MSRP! Montana and Molotow paint markers are already 15% off our everyday price for our Make Your Mark Sale, so you can get all the color you need for your Mitchell Mash Up! Categories: Wet Paint Weekly Workouts | Tags: art supplies, FW Acrylic Ink, Golden High Flow Acrylic, Joan Mitchell, Make Your Mark Sale, Paint Markers, Weekly Workouts, Wet Paint St. Paul | Permalink.